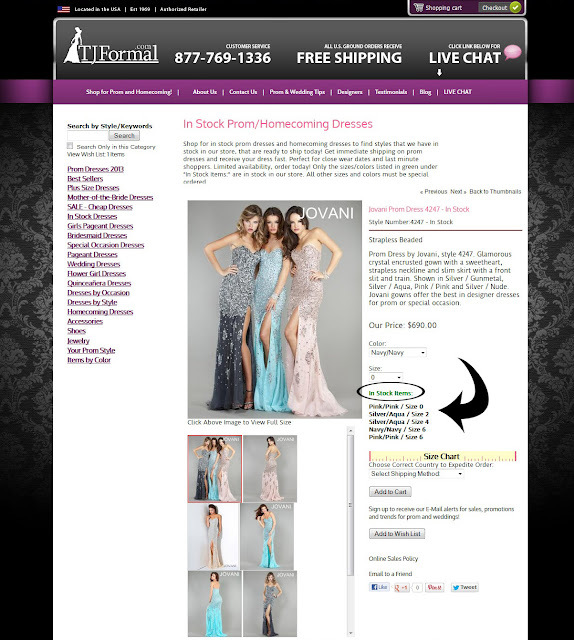 TJ Formal Dress Blog: Need a dress fast? See our In-Stock dress departments! Need a dress fast? See our In-Stock dress departments! Did you know TJ Formal has thousands of dresses in stock in their stores? And any of those dresses can be shipped out the same day you order it! We get in new dresses several times a week and put them on our website. How do you tell if a dress is in stock vs. having to be ordered from the manufacturer? Check out the graphic below. Under the size box, we list the sizes and colors that are in stock in our store under the green "In Stock Items." This dress is showing that we have 5 dresses in stock and what sizes and colors are available. Anything other than those 5 dresses, you would need to contact us to see if we can special order it from the manufacturer. We have prom and homecoming dresses in stock. Like Prom Dress by La Femme 18216.